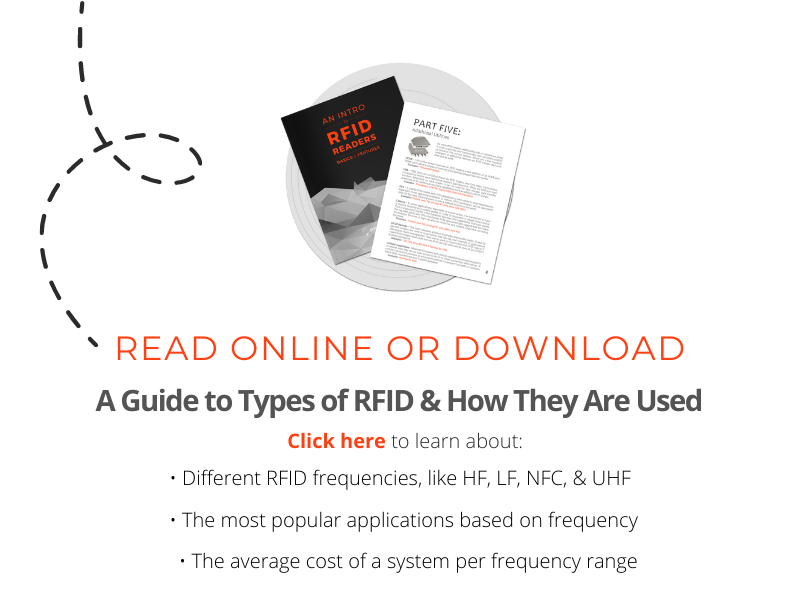 Understanding the way that an RFID system communicates, at least on a basic level, is a necessity—especially for deployment. RFID knowledge, together with extensive testing, is the key to a successful RFID implementation. Tag and reader communications rely on two scientific principles: physics and electromagnetism. In RFID systems, readers and tags communicate mostly through the method of electromagnetic coupling. In order for an RFID tag to communicate with an RFID reader/antenna, the tag circuit and reader circuit generally must couple in some way. Coupling is a transfer of energy between two electronic items or two circuits. Two main types of coupling are present in RFID systems: capacitive and inductive. The way that the two circuits couple can determine the read range and frequency of the system. Defined below are coupling techniques along with some frequently used terms in the industry relating to communication. Capacitive Coupling – flush to 1-2 cm – systems that use capacitive coupling use electric currents instead of the magnetic field in order to couple. Contact to a few centimeters of read range is normal for (LF) or Low Frequency communication because of the need to produce an electric field using electrodes. Because this type of coupling is only effective at such a small proximity, it is not used by very many RFID systems on the market today. One application example is access control/smart cards. Close Coupling – Close coupling can employ electric or magnetic coupling depending on the reader and tag. Readers employed for close coupling using a magnetic field have a winding primary coil and when the tag is in close proximity (0.1 cm – 1 cm) the secondary winding coil of the tag combines with the primary coil via their shared magnetic field in order to communicate. Readers and tags that use electric-field coupling are constructed so that the coupling surfaces when brought together, and inserted parallel, form an electric current for communication. Inductive Coupling – 1 cm to 1 m – Inductive coupling relies on the magnetic field of the reader, which means that this coupling only occurs in the near-field. The size of the near-field is dependent on the reader, but can be generally defined as touch up to a meter. Inductive coupling is seen in LF, HF, and UHF applications that include coils/antennas in the tag infrastructure. Increasing the amount of loops of wire (coils) in a tag that uses inductive coupling increases the amount of current that would be generated in the tag. In turn, this would increase the power of the transmitted signal from the tag back to the reader. Some example applications include NFC Smart Posters, certain access control applications, and any UHF application with a read range under 1 meter in length. Magnetic Coupling – the term magnetic coupling refers to any coupling that occurs using the reader and tag’s magnetic field (see inductive coupling). Radiative Coupling (backscatter) – 1 m to +4m – Using backscatter to communicate between readers and tags is not a true method of coupling; it is actually a communication method involving electromagnetic waves. Electromagnetic waves are sent through the air from the reader antenna to the tag antenna. The energy is received by the tag antenna and a small amount energy is then reflected back to the reader. Most UHF systems use backscatter in order to communicate between tag and reader. One common exception is when the tag and reader are in close proximity. When in close proximity, UHF RFID systems will elect to couple magnetically/inductively. Race timing, asset tracking, and file tracking are three applications that use backscatter for reader tag communication. To learn more about reader and tag communications, checkout our blog post on RF Physics, and as always please comment below or contact us with any questions.